This window will be shown when you have no (valid) license installed, or when you want more information on acquiring a license. 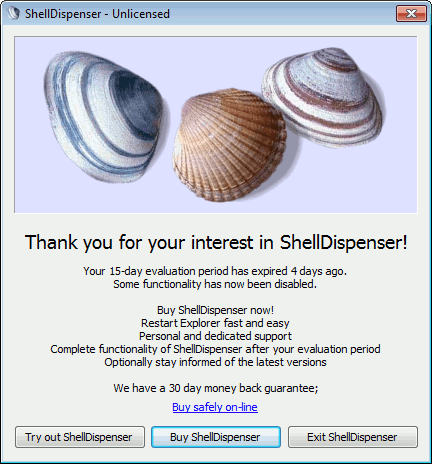 This window shows you how you can obtain a license for ShellDispenser. It also shows you the number of days you have used ShellDispenser. After you have evaluated ShellDispenser and wish to continue using it, or if you want to buy additional licenses, you can obtain a license from the ShellDispenser website (which can be opened by clicking the link). You can also go directly to our web shop by clicking the button "License now". The "No license" window will automatically pop up when you have not installed a license for ShellDispenser, or when you select the "Help \ How to license..." menu item in the main window. Close this window and exit ShellDispenser (button not always present). Opens your browser and opens the ShellDispenser web shop. Close this window and continue using ShellDispenser. Show the "No license" window help page.